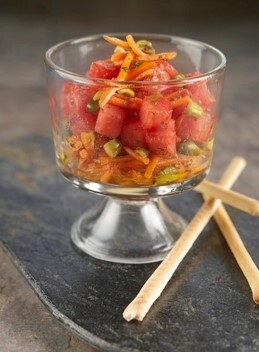 RECIPE: CARROT, PISTACHIO AND WATERMELON SALAD - What About Watermelon? Our last recipe offered a tasty alternative to traditionally boring Thanksgiving breakfasts. Today’s recipe is one that might actually make an appearance at the dinner table. Or, if not at the dinner table, maybe it’s something you can whip up as a pre-meal snack for hungry guests! Whisk together the blueberry vinegar, Italian herb blend, pepper and honey. Whisk the olive oil into the mixture in a slow stream until thickened. Layer the shredded carrot, watermelon and pistachio nuts in a shallow bowl or deep serving platter. Drizzle with dressing and serve.